This diminutive infrared remote controller fires your camera up to five metres away (from front of camera or by bouncing the beam off a solid surface towards the camera). Compatible cameras have the wireless receiver built-in as standard. Includes two modes – immediate and 2-second delay. Ideal for self and group portraits, or as an alternative to a remote switch. A replacement for the RC-1 and RC-5 units. The remote can also be used to start and stop movie recording when filming with selected EOS cameras since the EOS 60D (launched 2010). 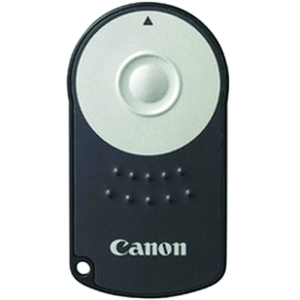 Supplied with pouch and CR2032 lithium button battery. Also compatible with the following EOS film cameras: 10, 100, 30, 33, 50, 50E and IX. The RC-6 is a wireless transmitter (infrared rather than radio waves). To work, it needs a receiver. Unlike wireless controllers, the receiver for the RC-6 is already built into a range of EOS models. One reason the RC-6 is relatively inexpensive is that you are only buying half the system. You have already paid for the other half - if you have a compatible camera. It is not possible to buy a separate receiver for the RC-6. If you do not have the right camera you will have to look at alternative methods for remote firing. The RC-6 has a small hole in the bottom left corner for attaching a lanyard (not supplied). The RC-6 is a very simple device, controlled by just a button and a switch. Make sure the drive mode is set to remote control. Aim the small black arrow in the silver circle at the camera and press the button to fire the shutter. A switch on the back gives the option of immediately firing, or firing with a 2-second delay. Good item to have in the bag.